Our February / March issue is out! 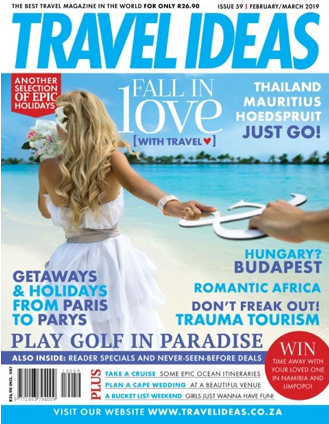 Travel Ideas’ latest issue is out now! Imagine some of the world’s tallest skyscrapers lining one of the busiest harbour waterfronts – this is the iconic night skyline of Hong Kong. Now imagine those buildings being dwarfed by successive blasts of massive fireworks! This was how I witnessed the countdown to 2019! 45 changing frames in a minute and ten minutes long, costing 1.8 million dollars. Hong Kong’s Victoria harbour puts on a display beyond imagining! We arrived at our promenade viewing spot at 8pm, amongst a 350 000 strong crowd, eagerly anticipating a renowned event – fully expecting a cacophony of noise. This, however, was not the case with the spectators very calm and relaxed. The four-hour wait went by in a flash, with board games and chatter amongst strangers under a clear sky – albeit a chilly one – not something I am familiar with in HK. I was equally impressed by the management of crowd control by authorities- with the masses of people clearly accustomed to large numbers of bodies in small spaces. Every single person respected the boundaries and rules and there was not a moment’s disruption or chaos. What a countdown! Everyone participating in the New Year’s Eve buzz … and at precisely (as with everything in HK) midnight, thousands of pyrotechnic shells were discharged from barges in the middle of the bay and the most magnificent ‘pyro musical’ show of perfectly synchronized and choreographed lights and fireworks began – the explosions reverberated through our bodies and the atmosphere was electric. The fact that it took 2 hours to leave the area, is testament as to how busy it was. A phenomenal experience ranking in the top 3 travel experiences to date for me! We’ll be featuring Hong Kong in our next issue, so watch out! Be sure to peruse our romantic options for this month of love – incredible venues both local and abroad. ‘Love looks not with the eyes, but with the mind. And therefore is winged Cupid painted blind.”- William Shakespeare. Remember to Like our Facebook Page for regular competitions and more on interesting destinations and festivals around the globe, as well as informative travel tips and info. Thank you all for your continued support and on behalf of the Travel Ideas Team I would like to take this opportunity to wish you all a happy and prosperous year ahead filled with many new adventures.